As soon as Tracy saw the hero challenge she knew that she had to use the Charles and Amelia plate from Artistic Outpost. I admire anyone who follows their dreams and that is exactly what the famous aviators Charles Lindbergh and Amelia Earhart did, accomplishing flights across the Atlantic Ocean. Charles was the first pilot to fly solo and Amelia was the second person in the world to make the journey by air. I used the fabulous riveted patchwork technique from Tim's A Compendium Of Curiosities Volume ll using Metal Foil Sheets to give the perfect industrial feel for my aviation tag. 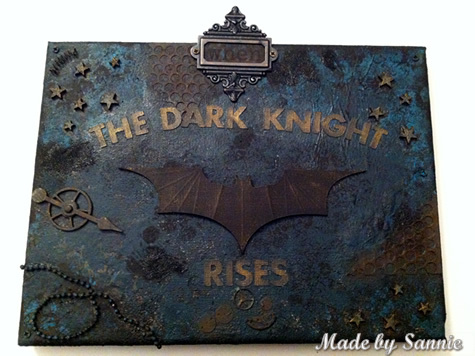 As the total movie addict Sandra Mouwen is, she made her first canvas inspired by the movie The Dark Knight Rises. I was a bit nervous and wasn't sure what to do when I started. But when I pushed myself to go on and let loose, I made the first layer of paint using bubblewrap as a dabber. Then a bunch of layers followed. I had lots of fun embellishing it with the wooden stars, the ball chain, the sprocket gear and the game spinner. The logo I traced of an image of the internet and cut it out with my Silhouette Cameo! The folds are made with the Martha Stewart Scoring Board. To adhere all things down I used lots and lots of Multi Medium Matte. Candy and Tracy were on the same inspiration wave length when it came to Artistic Outpost's Charles and Amelia stamp set. The minute I saw Artistic Outposts' Charles and Amelia stamp set, it reminded me of my favorite picture of my Dad taken at the beginning of his military service during World War II. This triptych frame honoring Heroes, especially my Dad, was born out of those memories. The chipboard frame is covered with Ranger's Metal Foil Sheets. 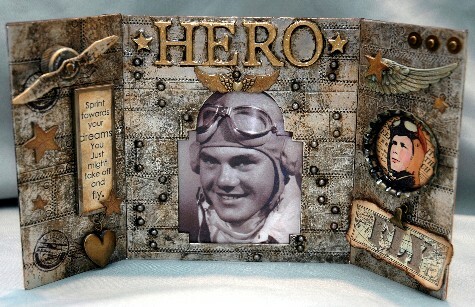 "HERO" and the stars are faux embossed thanks to Tim Holtz' Mixed Minis. Detailing of the faux welded sheet metal is achieved with Ten Seconds Studio's Cool Tools and Ball And Cup Sets. Everyone needs a hero in their life and Ashli is lucky enough to be married to one of hers! My husband really is a hero in my life, for so many reasons. What fun it was to do a layout celebrating him! First, I put another type of hero to good use: Hero Arts Cling Rubber Stamps. Once my stamped patterns were dry, I cut strips to layer over the gorgeous sunburst paper from Basic Grey. A Heidi Swapp Color Magic Memory File cut to size makes the perfect little folder for my journaling. And, of course, some Pink Paislee and Studio Calico letter stickers finish off this interactive element. A final touch of little wood arrows along side the sun rays help point the eye to my hubbs, my hero! When I saw this sentiment on the new Stamper’s Anonymous Classics set #5, I immediately knew what I wanted to do for the hero challenge. The base of the layout is watercolour paper and quite a number of the Classics stamps were clear embossed, before misting with Dylusions spray inks. I love birds, and cut the Sizzix Bird Branch and Mini Bird from grungeboard, painted with Rock Candy Distress Crackle Paint and inked with Distress Stains. I just had to use some game spinners too; they add such fun direction and movement to a layout. My card celebrates the heroes who serve for us. I used the American flag and the vintage soldier from the Artistic Outpost Hero plate. I added the U.S.A. Image from the Artistic Outpost She-Roe plate to bring another pop of black into the design. The banners were embossed using the Cuttlebug Stars Embossing Folder. This is for all our Heroes who serve and protect us everyday. Terry was inspired to make a tag this week. 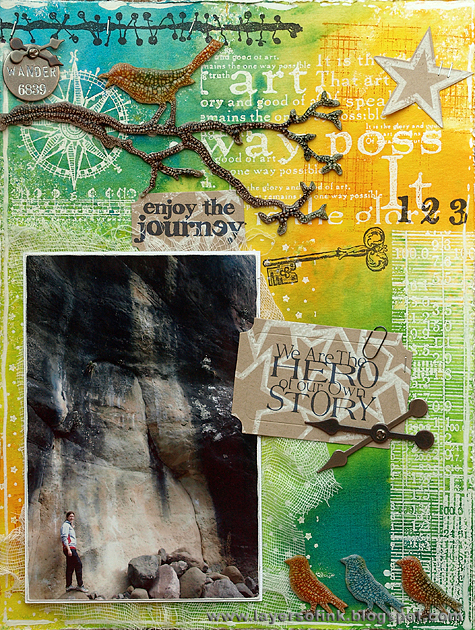 I just had to use the new Stampset from Artistic Outpost, Charles and Amelia, I think it was such an adventure from Charles and Amelia to fly across the Atlantic Ocean and a great accomplishment. I have great respect for them. On this tag I have played with lots of distress stains, distress inks and the white paint dabber. I had an idea to emboss the metal foil with the springtime embossing folder from Tim Holtz to give it a swirly look. To finish my tag I played with utee on the image and placed some game spinners and sprocket gears. 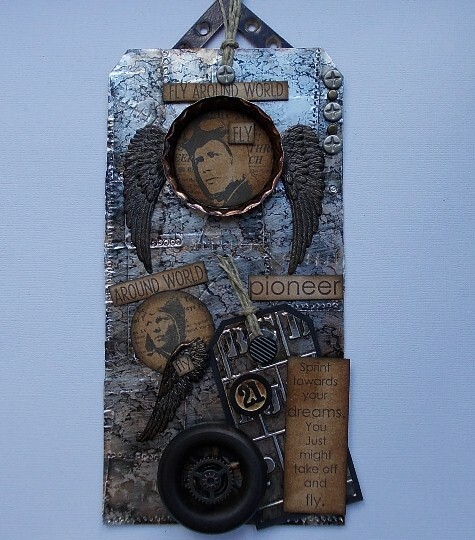 Sarah was inspired by the opening of the London 2012 Olympic Games to create a Steampunk style tribute to the heroes of the Industrial Revolution. When I saw the opening ceremony of the Olympics I was really made to think about how much we owe to the forefathers of industry, invention and innovation. I mean... where would be without machinery, engineering and architecture? 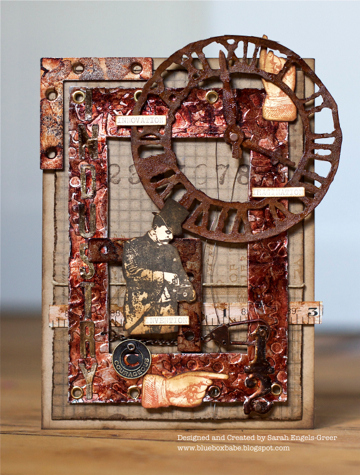 So I dived into one of my favourite styles and designed a Steampunk card full of metalwork, gadgetry and rusty tones. I layered up Kraft Resist Paper with an embossed Metal Foil Frame and piled on the Idea-ology, with Wendy Vecchi's Steampunk Gent as the perfect inventive genius. Next time you cross an impressive bridge or ascend to the 58th floor, take a moment to think of the mind that created the possibility. Finally, I (May) was inspired to make a card to send to one of my own heroes. I just love using the new oversized Ranger tags as cards as I have here. Spraying alcohol ink with my compressed air (that is normally used for my computer! 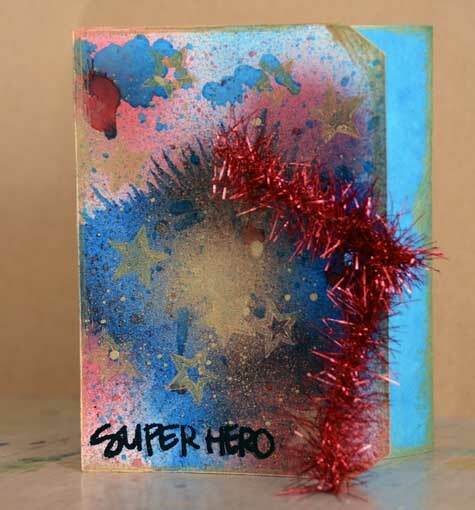 ), stamping some stars with gold paint, and finishing it off with a bit of tinsel and my super hero stamp, this card was a lot of fun to make. I wanted to keep it somewhat fun and playful, and I hope that the note I add inside makes this person smile. Now that we've shared the team creations - we're ready to see yours! As always, Simon Says Stamp is giving away a $50 gift voucher that will go to a random entry chosen by Random Generator. The challenge will close at 11:59pm Eastern time on Sunday, September 16th and the winner will be announced during the following week. To qualify all you need to do is create a new project that ties in with our theme and post it, along with a link back to this challenge, and add a link here. Hope it's okay to consider a sister my hero--she really is! Just uploaded my tag for the challenge! I think a sister as a hero is wonderful! I can't believe it! I just finnished tonight a super hero card for my son. will take some good photos and upload it. Great works from the team! what a wonderful way to honor all the heroes of the past and the heroes of 9/11...thank you for the challenge...the DT samples are outstanding! Again really awesome inspiration from DT! Thank you! My hero...easy. The project a little more complex lol. Challenge: read all about it!